The WorldLoop operational model combines local collection and dismantling efforts in developing countries with best-in-class, technologically advanced recycling solutions available in OECD countries. By providing an alternative to primitive recycling practices, WorldLoop creates a win-win solution for the economy, environment and society. Studies have shown the potential benefits of this “Best of 2 Worlds” approach in helping developing countries to address their e-waste problems and elevate recycling from primitive practices to a formal solution. In 2010, StEP conducted an extensive research project to validate the approach. It found that, by fostering proper manual dismantling in the pre-processing stages and adopting state-of-the-art technology for the complex fractions, the environmental impact of recycling is reduced while the economic gain increases. Read the full study here. Collection: This is the biggest challenge in ensuring a sustainable e-waste management solution, as minimum collection volumes are required to ensure self-sufficiency. The capacity to recycle large volumes of e-waste requires an extensive network using various collection methods and channels. This infrastructure should be organised at an official, ideally governmental, level, but is not available in most developing countries.In general, e-waste can be collected from corporations, SMEs, the public sector, non-profit organisations, learning institutions, maintenance and repair companies, individual households, dumping grounds and the informal sector involved in e-waste repair and collection. Manual dismantling: After collection, end-of-life electronics are dismantled locally, separating the non-hazardous fractions such as iron, steel, copper, aluminium and plastics from the hazardous components. Non-hazardous components can be resold on the local market and reintroduced into local production processes. Manual dismantling results in high recycling efficiency and also supports local job creation. Automated processing: After manual dismantling, certain e-waste components need to be processed using specific equipment or machinery (e.g. cathode ray tubes (CRTs), cables and wires). Others, such as plastic casings, are processed automatically to reduce their volume. International recycling and disposal: Some e-waste components are highly complex to process and may contain toxic substances. To allow safe and environmentally sound recycling, these components require specialised treatment that is only available today in some OECD countries. Therefore, they are exported to best-in-class recyclers in Europe. This ensures maximum value from extraction, which flows back to the dismantlers and recyclers in developing countries.Examples of e-waste fractions that require recycling and disposal in OECD countries are: printed circuit boards, lead-containing glass, transformers, mixed scrap and device-specific components containing toxic substances. 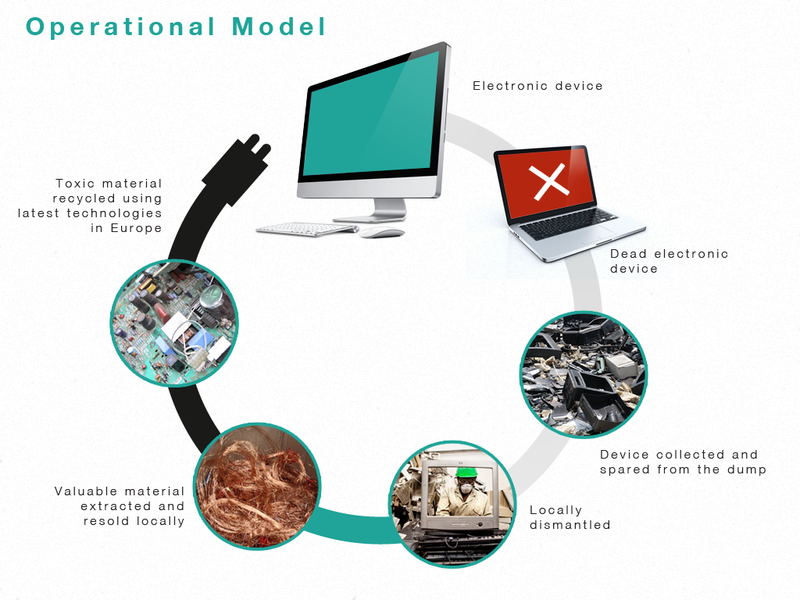 In the WorldLoop operational model, numerous organisations in developing countries can be involved in the collection and manual dismantling of e-waste at a national level. An advanced, automated processing facility can be made available at a regional level, while recycling and disposal of the complex and hazardous fractions is carried out in countries equipped with the necessary technology. The combination of these steps at different geographical levels allows the system to benefit from economies of scale and is the core of WorldLoop’s operational model. E-waste recycling offers tremendous opportunities for employment and economic growth in developing countries. However, while some e-waste fractions generate revenue, others incur processing costs. As the WorldLoop model aims to be holistic, with environmental sustainability at its foundation, WorldLoop provides member organisations with incentives to collect all e-waste fractions, not just the valuable materials.